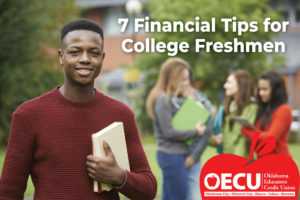 Entering college can be scary, but there’s nothing more anxiety inducing than thinking about being financially stable. During orientation week, banks and credit card companies may be offering credit cards specifically for college students. If you’re wanting to build credit, this is a great option for you! The interest rates for beginner cards are typically low and you may have a little while before interest hits. Make sure you read the fine print and are responsible enough to keep up with your payments. Saving and budgeting is hard, but it isn’t impossible. Take time to sit down and evaluate your income and reoccurring expenses. Make sure your necessities are covered while also giving yourself some funds in case of emergencies. It might be a good idea to set money aside as fun money for trips or nights out too. It’s easy to head straight to the mall after pay day, but consider pulling some money out every check for bills and savings before anything else. When the first of each month rolls around you should have enough money to pay your bills and other expenses. Being a college student is usually synonymous with being broke. Even if you’re not, the stereotype comes in handy because a lot of companies give discounts to students. Websites such as Unidays.com and StudentBeans.com offer student discounts to hundreds of items and websites! All you need to verify your status is a student email account from your university. Textbooks are expensive, there’s no doubt about it. To combat high prices, ask people who have taken the class before and see if they will sell you their book at a reduced rate. Don’t want to buy text books? Amazon allows you to rent books for a flat rate fee! Use a planner to write down specific events happening such as birthdays, concerts, or game days so you have an idea of what you’ll be spending. This will help when creating a budget so that you can take part in these events without over extending your financial resources. Many universities offer free campus activities such as concerts and movie nights! Go to your school’s website or activities pages to see what looks interesting to you!